Soups keep you warm when the climate is really down and chilled. Soups are our favourite dish and i have already shared varieties of soups. However i have couple of soups to dish and post in my space. 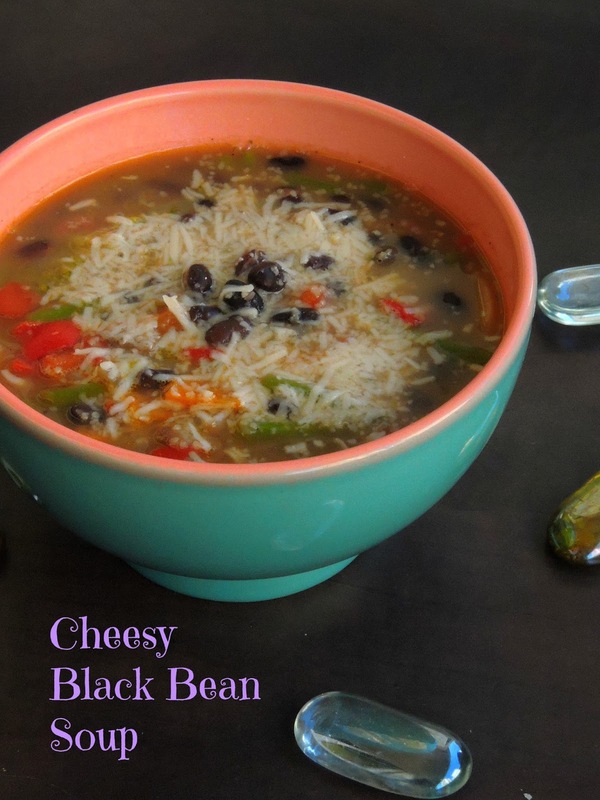 One among those soups is this fantastic, healthy, nutritious, wholesome soup with black beans, vegetables and cheese. 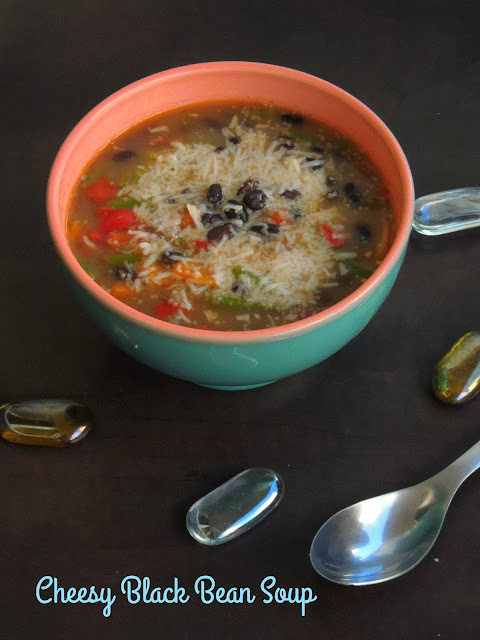 Adding black beans to a simple vegetable soup makes this soup more healthy and satisfying. A warm bowl of this soup with some bread slices as accompaniment will definitely makes a super filling dinner or meal.Since am posting different dishes with black beans, i couldnt stop myself posting this hearty soup which i dished out few days back for our dinner. This Cheesy Black bean soup is simply prepared with couple of vegetables and cooked black beans. This soup is completely gluten free which suits prefect for dieting people if cheese is not used. However i couldnt stop myself adding the cheese as my younger one love cheese in soups. 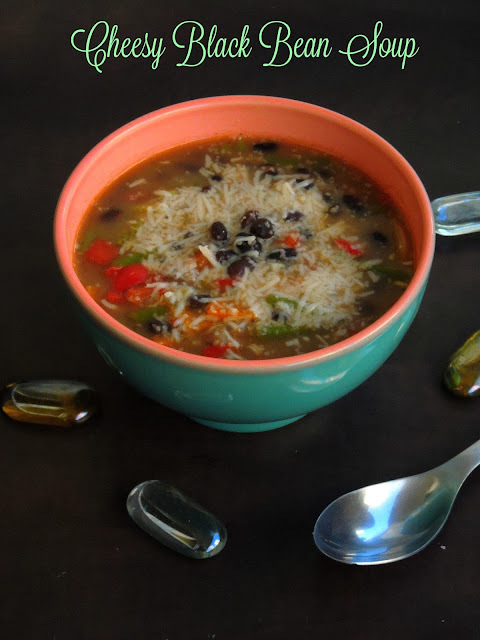 Black beans gives an excellent texture to this warm bowl of soup.Am running a month of blogging marathon with 5 ingredients for 5 weeks as theme under Cooking Carnival. I picked dry beans, and am showcasing a dry bean every week. And this week's ingredient is Dry black beans,after some delicious and nutritious dishes with this incredible bean, today's post is this lipsmacking cheesy black bean soup with loads of vegetables. Heat enough olive oil in a vessel, saute the chopped onions until they turns transculent, add now the mixed veggies and cook for few minutes. Add the cooked black beans, cook for few seconds. Now add the vegetable broth,pepper powder,salt,dry parsley leaves and water,cook everything in medium flame until the veggies gets well cooked.. Serve warm topped with grated cheese. I love such light soups loaded with beans and veggies. This is a filling soup! Cheese is an interesting and welcoming addition to this clear soup. Very attractive bowl of soup , looks very inviting with those veggies and cheese . Gorgeous bowl of soup. Love the addition of cheese on top..
My kids will love that bowl of soup what with so much of cheese on top!! Addition of cheese makes it more richer and tempting..
OMG.. I love soups.. I so wish I could grab that bowl right away. That sup can be my dinner! Loaded with goodness and my favorite bean. The soup looks perfect for dinner. I am making this once the evenings get more cool! This is such a delicious soup. I wish I can get a bowl of it. Cheesy and comforting soup -- perfect for a chilly winter weather. So comforting and delicious looking soup. Love this heavenly soup....am adding it to my soup collection asap! That bowl of soup looks so comforting!! !This is what we all need, for this chill climate! !